This article assumes that you've already installed Nimble Streamer. If not, then use this installation instruction to get an instance on your server or desktop. If you have old version of Nimble, then just easily upgrade it. With all these scenarios being up and running you can start setting up DVR. 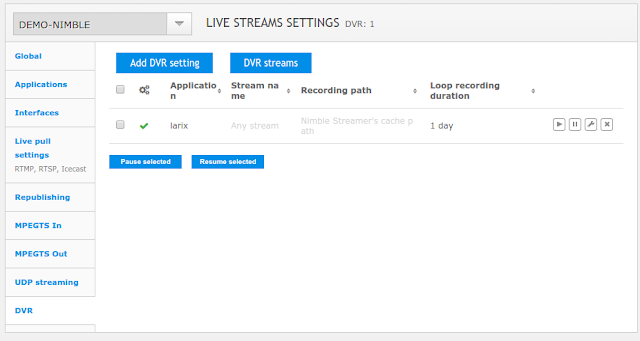 Go to "Nimble Streamer" -> "Live streams settings" menu to open the setup page. Then click on "DVR" tab to open its settings. Here you can see list of setting. In our example we've set up something, otherwise you would see an empty list. Click on "Add DVR setting" button to start the setup. Here are the parameters you can define. Application is the name of the application which is used during the live streaming. Whatever application name you use in live stream, it must be specified here. Stream name can be used to recording of some specific stream. If it's not specified, all streams will be recorded, each one separately within recording path. Recording path is the location of the storage which you'd like to use. It needs to be a file system location. If you don't specify it, the default cache path of Nimble Streamer will be used. Loop recording duration is the maximum time window that keeps the content. E.g. if you set this to 1 hour, start streaming and your stream lasts for 1 hour and 10 minutes, then first 10 minutes of recording will be erased to keep the last 10 minutes. This duration mostly depends on your storage capacity. If you don't specify the duration then Nimble will keep recording until it has space at the specified location. Maximum size works the same way as Loop recording duration, but it uses archive size as a trigger to start erasing old recordings. It's specified in megabytes. Read-only mode allows using pre-recorded archives as well as performing scheduled recording. This mode allows pausing the recording process while the archive will be still accessible for playback. Read this article for more details on operating DVR this way. Advanced settings include the following parameters. We'll release a separate article describing advanced recording tuning process. Segment duration is the duration of the chunk being used for media storage. Thread name and priority are used for splitting recording process among several threads. In the example above we used Larix Broadcaster mobile application to push RTSP stream into demo Nimble instance and we've set up its recording accordingly. We specified only the application name because it was up to the streamer to define a stream name. You may also easily set up recording from existing incoming and outgoing streams lists. 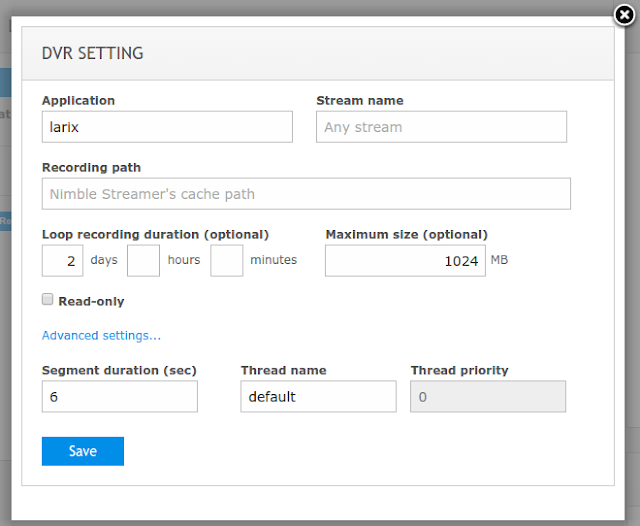 Being in the respective lists, just click on recording button to be redirected to previously described DVR setup dialog. The ABR streams recording is set up in the same way as single-bitrate streams. When setting up DVR, you need to specify ABR application and optionally stream name to define DVR recording. Then you'll be able to play recorded stream the same way as a single-bitrate one. For playback details, check the following section. The recording process starts as soon as Nimble Streamer starts getting the incoming stream. Each stream is recorded into its own recording path. If only an application is defined then a sub-directory after stream name will be added. If the stream was specified then its path will be used. Each recording session will be appended into stream location. So you can start, stop and resume incoming stream several times and Nimble Streamer will write the content as if it would be a single session. Obviously, the playback will be played as a single outgoing stream. To view the existing DVR streams, go to "Nimble Streamer" -> "DVR streams" menu to open DVR streams list as shown below. As you can see we had 2 publishers, each having separate stream name. So every stream was recorded separately. For each one you can see its server and name, recording path and current recording size, total duration and some media parameters. You also have an option to remove un-used streams recordings as well. Now for every stream, you can click on a question mark to open sample dialog. 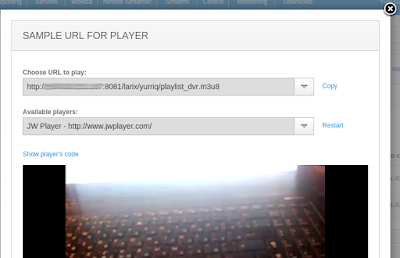 Here you can copy the outgoing DVR stream URL for further usage in your player or application. It also allows viewing the DVR stream in selected players to see what was actually recorded before giving the link outside. You may use it in any HLS-capable players. Both MPEG2TS and fMP4 DVR streams can be played simultaneously. So you can provide your users with playlist_dvr.m3u8 and playlist_fmp4_dvr.m3u8 URLs depending on their device type. fMP4 container will work the same way as MPEG2TS for all DVR-related features like selecting range or time shift. Watch the following video of Jan Ozer and Softvelum CEO Yury Udovichenko about dynamic packetizing, which includes the explanation of DVR large buckets functionality. Please notice that you may also control DVR via API in order to automate your streaming infrastructure. If you'd like to export DVR into MP4, you can use this API call or use this instruction for other option. Great feature, well done gentlemen. Thanks, Behnam! Looking forward to your feedback. Thanks! Feel free to sign up and try it in action. Can I bypass Wowza DVR and use Nimble DVR? I am also streaming multiple bitrates from Wowza, Any impact? We'll release ABR support this week and you will be able to use DVR with multiple bitrate streams. We've just introduced API for DVR: https://wmspanel.com/api_info We'll announce it very soon, please stay tuned for updates. Hopefully I'm not missing something here, is there a way for the DVR URL to provide the LIVE stream content if it is not currently DVR'ing? i.e. i have abr/stream_HD which will be live for 60 minutes ahead of event start, and at event start I will click Record on DVR. At which point any new users joining should see the DVR track, I wouldn't expect pre existing "live" viewers to magically see the track after record starts. Does that make sense? Also - you mention above extra articles to deal with threads etc., is there any guidance on that on a transcoder machine? I suppose what I'm trying to do is maybe slightly off-piste, rather than starting a stream 5 minutes before an event, I want it live showing canned footage to allow viewers to be satisfied stream is good; therefore 60 minutes of 'dead' air before DVR window is undesirable. Regular use case would be go live, hit DVR record, show starts, etc. You can use Time-shifted DVR as described in this article . So you can specify URL like /live/channel1/playlist_dvr_timeshift-3600.m3u8 and users will see stream 1 hour behind and can fast-forward up to current time. Is that what you need? Could you refine - what kind of guidance are you need? Is there some specific topic you want to clarify?